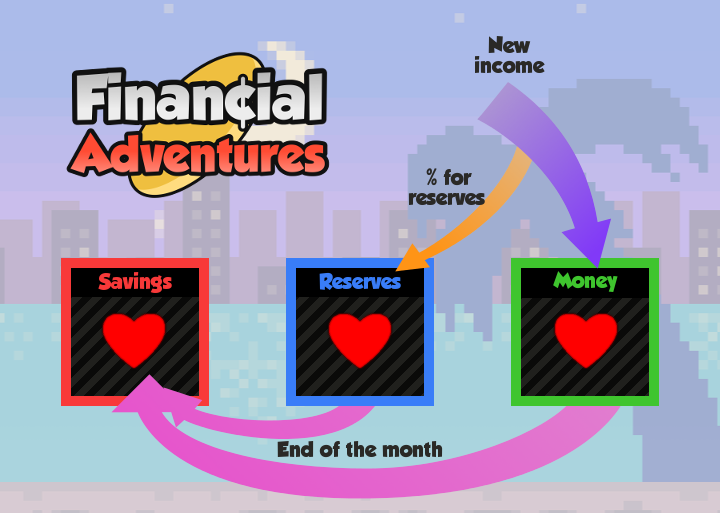 Financial Adventures is an Android application which function is to help you save money in a more enjoyable way: imitating a video game. The application creates a history and ranks the monthly situation of the user by using hearts in the style of a video game. Also, you can manage not bank loans. The application manages the money in a rather peculiar way to show how you're doing the current month as if it were a video game. For this, the money is distributed in three containers or boxes that represent, approximately, each health units hearts of your "game". Money. In this container the current month income money is saved, but before the percentage of reserves is subtracted from it. You should try that it never runs out to save more money than you had planned to do. Reserves. This container collects income reserves. If you consume this money you are saving less than you wanted to. Savings. This container stores your total savings except for reserves. If you're consuming it, it means you have less money than the previous month. The purpose of Financial Adventures is saving at the highest level, so at the end of the month, the contents of all containers go completely to savings. It means you have to introduce new income every month! When you first start Financial Adventures, you must set some properties to fit better your needs. Date format. You can set the way dates are displayed (dd/mm/aa or mm/dd/aa). Reserves per income. Indicates the percentage of each income to be saved in the Reserves container. Subunit. If enabled, allows the use of smaller than unity currencies. Hemisphere. Place on the planet where you live. The purpose of this value is to know the season for the stage. After you set these values, you must enter your savings: Do not enter the money you have received the current month, it shall be entered as income later to play with it. That is, if you have $500 in total, of which $200 have been received this month, you must introduce only $300 in this step. Note that the application divides the savings in cash or bank account, so please enter them separately as indicated on the screen. The next step is to add income for the current month (remember you must not introduce these in the Savings container, only the previous month money). To introduce press the green button "+ Income" and follow the steps on the screen. You can indicate a small phrase to remember about it. You can add new income as they arise over the month without problems. After configuring the application, you can add expenses as they arise by pressing the red button called "+ Expense". Follow the steps on the screen to complete the operation. You can assign a reason and a tag to analyze your habits later. Try not to empty the Money container! When a container is empty, you use another more important and don't save money. The main character is running on the main screen. In this area, depending on the set theme, health indicators, action buttons and money available in the current container are shown. You can see more of your money information by pressing the info circle-shaped button (yellow "i", third button). If you press the red circular button with a graph of the main display screen, the statistics menu opens. In this menu you can visually see the evolution of your savings every month and expenses whether global or tags! Financial Adventures has a history that records all transactions made thereto. In this option you can check all transactions you've done since you're using it, as well as the health outcome of each month. It is normal to see precision errors in Financial Adventures because it works with estimations and not connected in any way to your banking network. Step 1. Enter the total money you have on the correcting option, subtracting the amount you want to use this month. Step 2. Enter a new income with the money you previously subtracted. Note that the month may appear with an incorrect health because previous month's data are taken into account. Ideally, use this function as little as possible. Financial Adventures offers a number of premium themes that can be purchased at the in-app store. These themes change the characters, monsters, scenes and health indicators of the application. Each theme is unique: see their data at the store because some change daily, others for hours and even months. Similarly each theme may include different amounts of monsters and characters that change depending on the above factors and others. The basic theme, included by default, has 12 scenarios that change each month and assigns an enemy to every tag (8). But for example the theme of Dungeon Pets changes every day with a total of 6 stages and in each of them there is a Dunpet and different monster. You can change your theme at the store or at the fourth circle-shaped button (rainbow) of the main screen.